There are some things we do once and there are some things we do over and over. Collage with contact paper is one activity that never seems to fail. 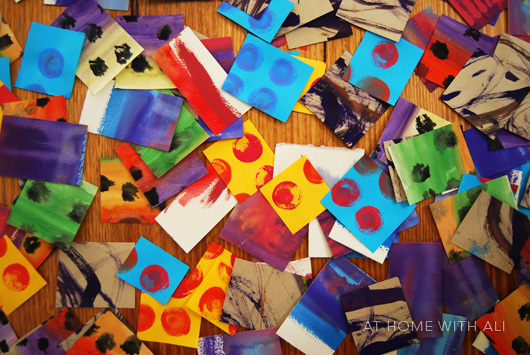 I keep a box of cut-up paper for collage, this makes it easy to set up a quick collage activity. When the kids are painting I will often sit down with them and paint too. Most of the time I end up using their leftover paint. I save my paintings and cut them up. I also cut up some of Boo's paintings – she is so prolific she does not notice if a few go missing. I never cut up Cakey's paintings. She gets mightily offended if she finds them in the collage box. The windows need cleaning, sigh! If you haven't tried this before, collage with contact paper is easy. Stick the contact paper with the sticky side facing out to a window or wall with sticky tape. Supply a container of cut-up paper or straws or pom poms or bottle tops or whatever you have. Until recently, Boo would stick things on and then pull them off until the contact paper had lost all stickiness. Cakey is an old hand at this, she had filled her contact paper within minutes. She wanted to fill the gaps between the square pieces of patterned paper. I cut up some strips of pink tissue paper and she created a very nice stained glass effect. 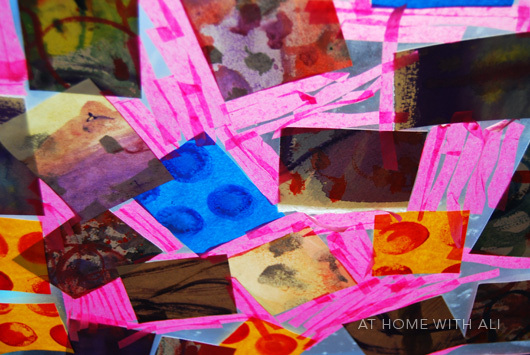 We love to use all sorts of materials for contact paper collages, you can read more here. 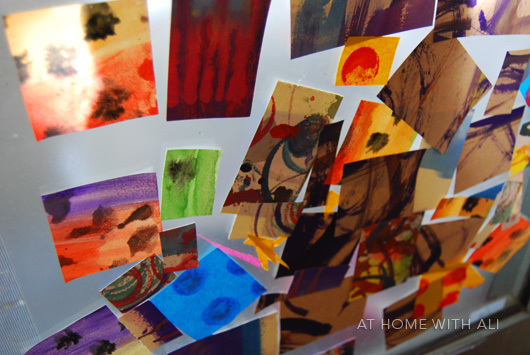 You can also find more ideas for using sticky contact paper at Learn with Play @ home. My daughter is obsessed with contact paper stained glass windows. We made them a few weeks ago to decorate her baby brother/sister's nursery......and now she wants to do it all the time. Thanks for the suggestion of using cut up pieces of painted paper. 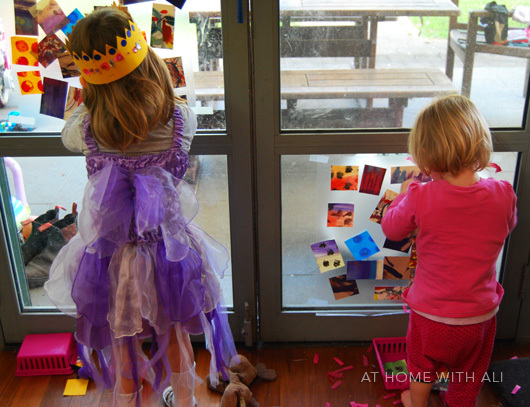 We love doing this activity Ali...and i did when i ran toddler rooms too but i never thought of cutting up paintings...they look great and i love your stained glass effect! My Ruby still loves to pull everything back off still too! I really like this idea. I think I will try it this week with the boys. The holidays are getting a little long... I love the idea of cutting up paintings and keeping them on hand. Great idea!!! Lovely idea. I'd say this kept the little ones entertained for a good while. Very creative! What a clever idea! So going to do with with all tree girls. I just have to get some contact paper. I wonder if I can do an animal verison too! Off to pin and stumble now! Great idea. I've used old art work to make small placemats for snack - laminate and they're ready to go. These our lovely - contact paper is very popular at our house too. I think we had to have the last one up on the patio window for about 6 months before they would agree that it might be time to take it down to make room for other pictures!